Summer is here and the Ocracoke figs are arriving! Here are some off of Marcy's trees. You may have noticed it has been over a month since our last post. We have had so much going on, it has been hard for us to keep up. We have some exciting performances around the corner. Hope to see you at some of these events if you are in the area! 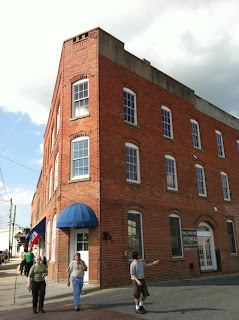 In April we began our Northeast tour with a concert at the Martin Arts Council in Williamston, NC. 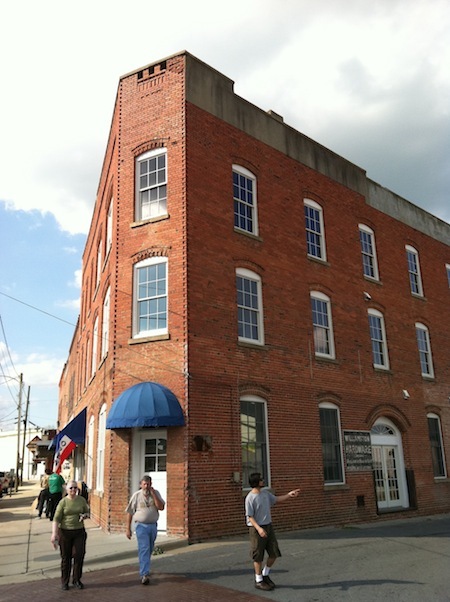 The Arts Council is housed in a beautiful Flat Iron building that has recently been renovated. 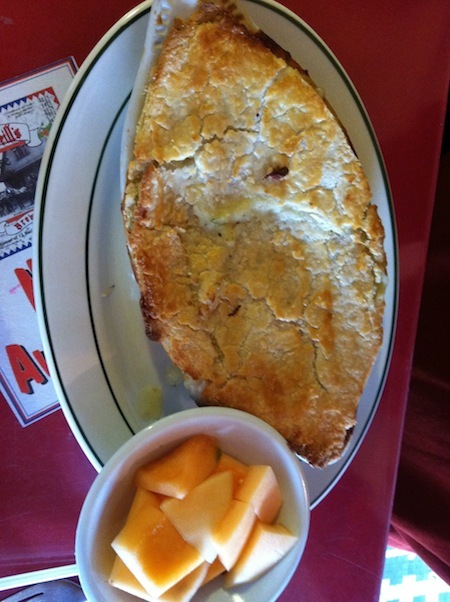 While in town we ate dinner at Griffins Quick Lunch All Family Restaurant. On April 21, we performed at the Shady Grove Coffeehouse Series near Richmond, VA. Thanks to Scott Hammer and all of the crew in Glen Allen! Then on to Washington, VA for a Sunday matinee at the Theatre in Washington, and community potluck and award winning breakfast with Rick and Kaye Kohler. On Monday we traveled to Wilmington, DE for a visit with Finley Austin. Finley has a house on Ocracoke Island and has been a longtime supporter of the Ocrafolk Festival. She also has some of the best looking mannequins in the great hall of her house. While in town we took a stroll around her neighbor and up to Rockford Park . 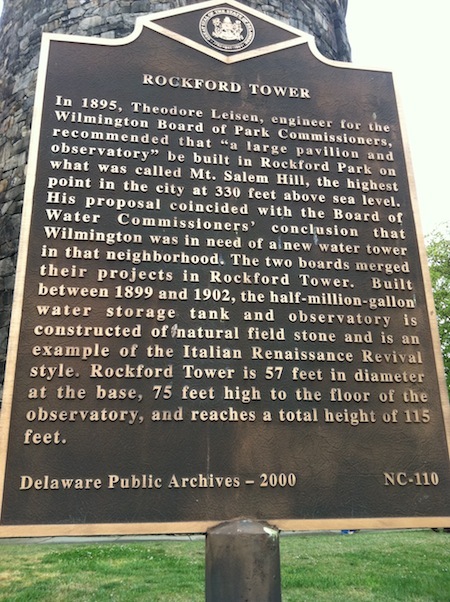 . . where we found the Rockford water tower. . . 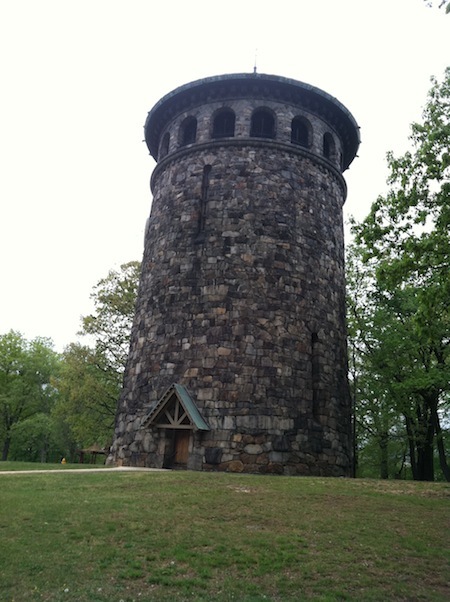 The tower was built in the Italian Renaissance Revival style and began construction in 1899 and was completed in 1902. Molasses Creek had many grandiose ideas of recording an album inside the tower, but Lou Castro was unable to scale the walls to check for sharks . . . so we decided to leave it be for the time being. You can read more about it below. People who think that Molasses Creek is solely a contemporary folk music group may be surprised to discover the band's secret identity. . . that of regional cuisine reviewers and foodie connoisseurs. To aid us in our quest to hunt down the best local food places, Marcy Brenner whipped out the Kindle and downloaded the latest version of Jane and Michael Stern's "Road Food" book (You may have heard the Sterns as guests on NPR's "Splendid Table" show). What followed was a complete rerouting of the Northeast Molasses Creek Tour 2012 in an attempt to eat at as many celebrated restaurants as possible. On our way to Boston from Wilmington, our first stop landed us at Libby's Lunch Patterson, NJ. Libby's Lunch has been frying up "Texas Weiners" since 1936, and advertised to be the restaurant closest to the Great Falls in Patterson. We would hunt down the falls later, but first lunch! Libby's was known for its fried hot dogs, and so that is what we ordered. They were pretty good, although a little on the salty side for Fiddler Dave. They did have Root Beer on tap which was a plus. Although we didn't emerge from Libby's will a holier-than-thou cholesterol rating, we definitely caught some neat historic character. After lunch we wandered around the area looking for this thing they called the "Great Falls." We saw a small dam that the road ran over and eventually stumbled on a park with a walking path. Over a walking bridge and then WOW! They weren't kidding! This was some surprise. Out of nowhere came a Niagara Falls drop. We landed for the evening at Bill Harley & Debbie Block's house in Seekonk, MA. Bill is a wonderful storyteller and musician and Debbie is a phenomenal quilter. We had an incredible grilled salmon dinner and shared stories and music. Thank you Bill and Debbie! After a leisurely morning we scooted off to Boston and headed to Johnny Ds in Sommerville. Boston is a hub for Fiddler Dave's relatives as well as some Ocracoke friends who snuck in for the evening to surprise the band. Despite the competition in town (Ira Glass hosting a film festival across the street, and the hometown hockey team, Bruins, playing in the championship games, we had a fun concert. Thanks to Dana & JJ having us for the evening performance. For the night the band stopped over at Fiddler Dave's cousin's Janet & Michael Sachs. We always have a great time visiting them. Hopefully if they ever move to another house they will still let us know where they live so we can stop over! Thanks guys! From Boston the band zipped to Granby, CT for a performance at the South Congregational Church and a stay with friends, Put & Nanny Brown. Thanks to Denny Moon for engineering another concert and to the Browns for fellowship and hosting us! On the road again for a Friday night concert in Randolph, VT at the Chandler Center for the Arts. 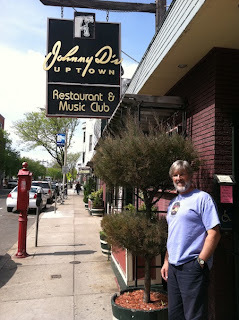 Before we could make it to the concert we had to check out another starred restaurant from the Road Food book . . . the Chelsea Diner. This one was Fiddler Dave's favorite in the whole trip! The Chelsea Diner in Brattleboro, VT had a classic look and an incredibly healthy, local, and creative menu. Fiddlehead ferns were in season and the little curly delights were oh-so tasty. The milkshakes were made from their very own ice cream, beef for the hamburgers was locally raised and grass fed, and the chicken-pot pie had a beautifully flaky crust. Here are some pictures. 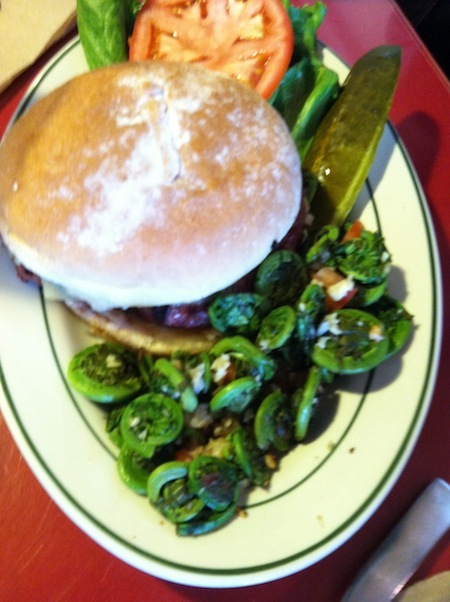 Look at those Fiddlehead Ferns! At the Chandler, Becky McMeekin made us feel right at home for the evening. While in town the band stayed with George & Jacqueline, and Scot & Barb. George and Jacqueline are incredible artists and Scot & Barb are musician's musicians. Molasses Creek ran into these inspiring folks at home on Ocracoke, NC. They always bring a musical smorgasborg of friends in November of each year for an island retreat. 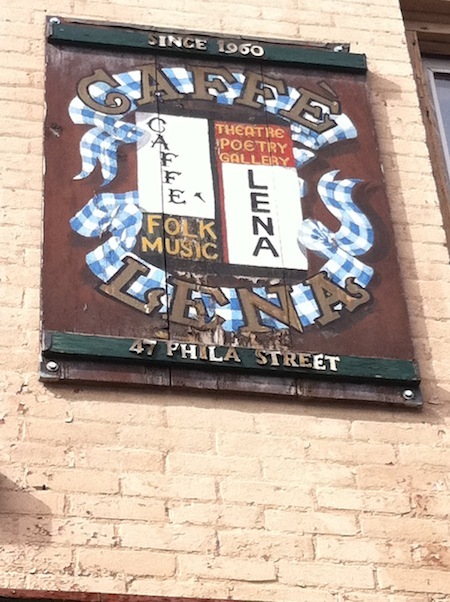 Saturday, April 28 . . . On to Caffe Lena, Saratoga Springs, NY! 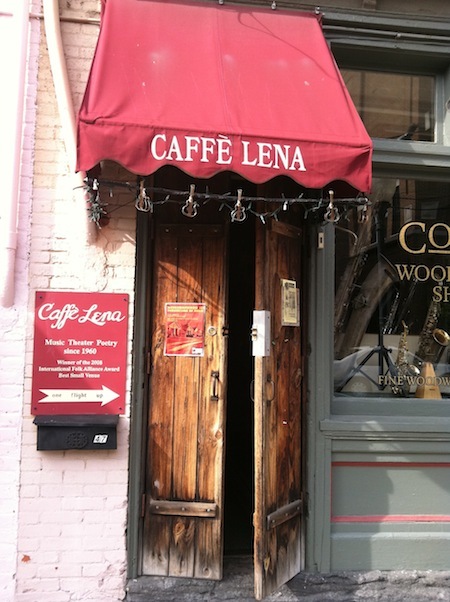 Caffe Lena is widely recognized as the oldest continuously operating coffeehouse in the United States. 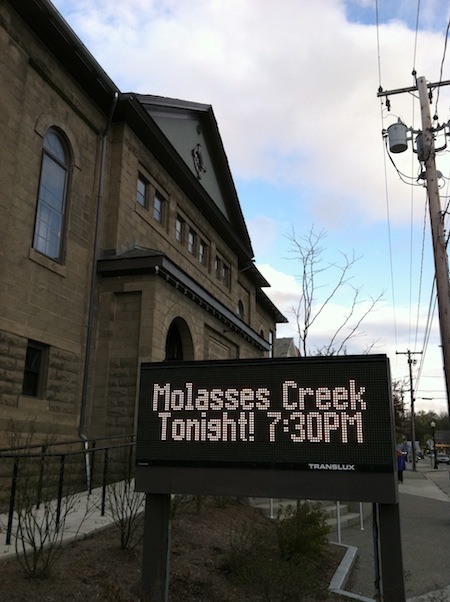 Folks icons such as Bob Dylan & Arlo Guthrie have graced its stage and this year Molasses Creek got to join their ranks, performing to a packed & enthusiastic house! Thanks so much to Sarah Craig for inviting us to play. What an honor! After the late night show, Molasses Creek retreated to Fiddler Dave's aunt and uncle's in Delmar, NY. Ron and Carolyn Tweedie are the hosts to beat the band (actually we like them a lot because they don't beat the band). With fine food from Carolyn, honey from Ron's own bee hives, and the hardest working Molasses Creek booking agents in the Albany area, this team tops our list! Molasses Creek gave a Sunday morning church appearance and then gave a concert for the Bethlehem Senior Projects Group. On Tuesday, Molasses Creek traveled to several elementary schools in Delmar and then zipped back out on the road, heading for Marcy's sister's place in Jefferson, MD. On the way we hit our final "Road Food" stop for the NE trip . . . the Glider Diner in Scranton, PA. Started in 1945, the restaurant features a shiny diner car with a larger add-on space for greater seating. 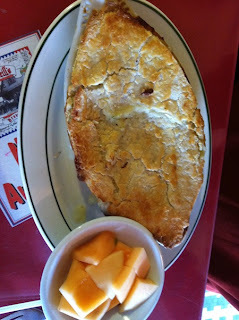 This was definitely more like the diner food we are familiar with, championing their thick milkshakes and gravy-fries. Sweet Potato Fries were nice . . . wow, that is a lot of gravy! That's the update for the moment. Stay tuned for the next blog about a trip to DC and Western, NC, and Norfolk's Tall Ships festival!